This damper is plain and simple the best in the world. 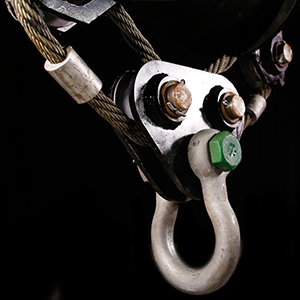 It's engineered to save cranes, run operations smoother, reduce down time and provide safer jobs. The vibro-insulating function is taken over by the hallow rubber spring, arranged vertically and loaded under pressure. With growing tractive force the angles are reduced, decreasing by that way the pressure stress of the hallow rubber spring proportional to the tractive force. So it is getting practicable to introduce high tractive forces (high pre-stressing with heavy tractive work) into the pile-drving and extracting equipment without overloading the hallow rubber spring. Simultaneously to the stretching and retracting work of the hallow rubber springensues a swinging of the lateral pressure plates around the upper flexible joints due to the cables aranged in geometric way. Even with maximal tractive stress the verticle swinging introduced by the pile-drive and extracting equipment is absorbed and not transmitted to the tractive cable of the carrier unit. The hydraulic and electric vibro-hammers of Tunkers are based on the principal of auto-synchronization and generate perfectly directed vibrations. The vibro-hammer with exciting shafts rotating in opposite way is driven by electric of hydraulic engines which transmit thetorque directly to the excitingshafts. The auto-synchronization is realized by the centrifugal force and by the constructional concept in a rugged and free-suspended vibration cell. Toothed wheels and gears are no more needed as well as no oil-lubrication. No occurence of high working temperatures, noise level, failures by gear damages and no decline in the workinglife of the roller-bearings. These constructional features have qualified themselves in practice to be the best-suitable concept for vibration equipment.